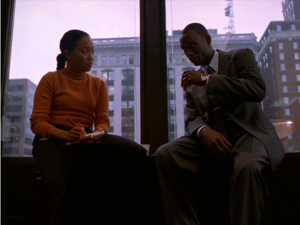 Here are a few thoughts on some shots from the opening episode of The Wire. I love this shot. 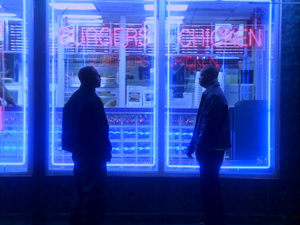 the two characters are framed in the restaurant window, with “burger” in neon above Wee Bey and “chicken” above D’Angelo. That tells so much about their characters. It’s all in the way the shot is set up. Because those messages are in the background, it’s easy to look at it and without focusing on them. The message comes across even if we’re not consciously aware of it. Inside the FBI office. 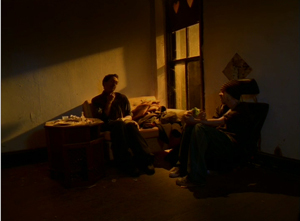 The design element of line is prominent here, dominating the top half of the shot. 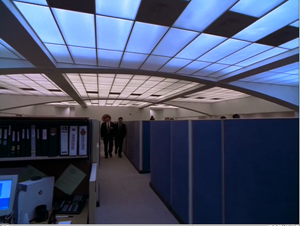 In contrast to most of the rest of the show, this setting is modern and clean – it shows where the money is, and by contrast, where it isn’t – see the basement office where the squad works. 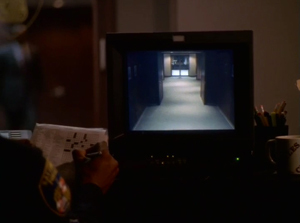 The theme of surveillance is constant in the series. 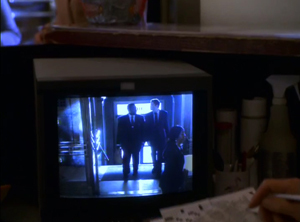 We see these frame within a frame shots, showing us scenes of monitors, through windows, in mirrors, all of which have us watching action rather than being in the midst of it. 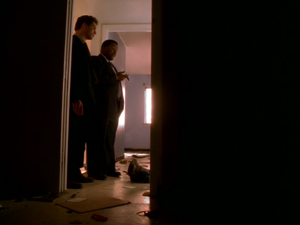 Bunk and McNulty in a vacant with a decomposing corpse. The way they’re framed in the doorway, all they have in front of them is darkness. It’s like they’re gazing into the abyss. That dingy yellow coloring infects many scenes in the first few episodes. It gives things a run-down appearance, which is especially effective here. 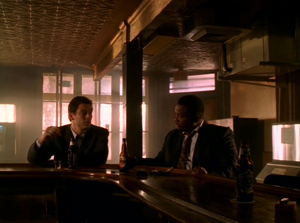 In each of these shots, and the first one above, we see a strong vertical line separating two characters. This serves to frame the characters separately. It could signal a number of things, from difference and disagreement to two sides of the same story. It makes for some strong images though. 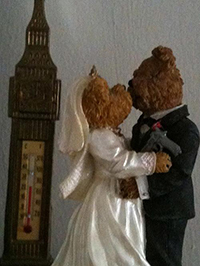 This entry was posted in Uncategorized and tagged design, ds106, photography, wire106, wire160. Bookmark the permalink. 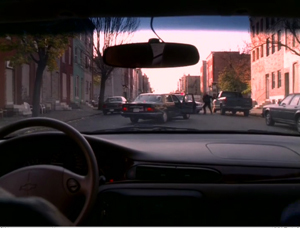 I really appreciate this intelligent and in-depth analysis of shots from the Wire.